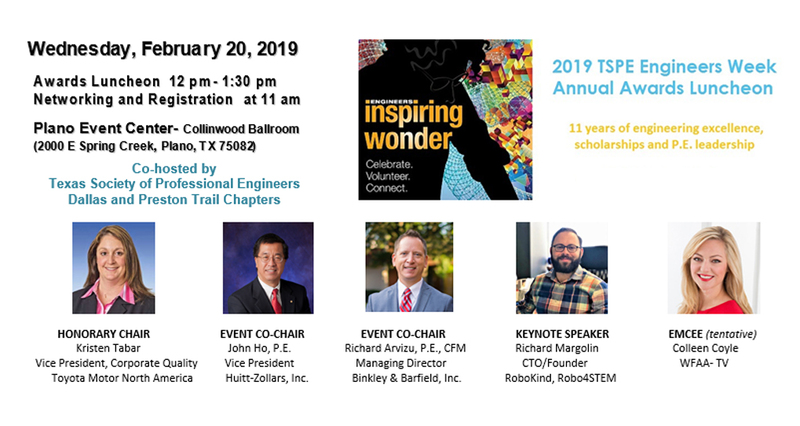 The mission of the Preston Trail Chapter and Texas Society of Professional Engineers is to promote and enhance the profession and licensed practice of engineering. This is done through promoting the importance of licensure, providing quality professional education and leadership programs to the professional engineer, giving a voice to the practice of ethical engineering, and providing positive publicity and recognitions of the professional engineer, such as E-Week Awards Luncheon. The Preston Trail Chapter serves Collin County, Dallas County north of IH-30 and IH-635, and Rockwall County north of IH-30. For more information on upcoming events with the Preston Trail Chapter click here.